This is plate 34 from Robert Melville Grindlay's 'Scenery, Costumes and Architecture chiefly on the Western Side of India'. Grindlay (1786-1877) was only 17 when he arrived in India in 1803. He served with the Bombay Native Infantry from 1804 to 1820 and during this period made a large collection of sketches and drawings. The island of Elephanta near Bombay derives its popular name from the figure of a gigantic carved elephant near the landing place. The temple is dedicated to Shiva, and was completely excavated from the rock in the 6th century. 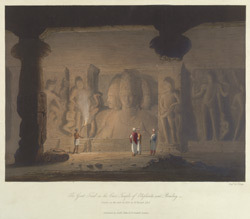 The many depictions of the aspects of Shiva contained in the cave-temple are considered among the masterpieces of Hindu art. The great Triad or 'Trimurti', a twenty-feet tall carving in relief that faces the main entrance, is the most impressive of these artworks. Trimurti means 'having three forms' and refers to the Hindu Triad of Brahma, the Creator; Vishnu, the Preserver; and Shiva, the Destroyer or Regenerator.